The sluggish recovery is forcing companies to find any way they can to squeeze out value for shareholders. With industry consolidation and workforce productivity already heavily mined veins, corporate spinoffs of noncore or underperforming operations - either in the form of stock to be held by the parent companies' shareholders or as initial public offerings - are another increasingly popular way to excavate returns. In 2012, public companies spun off 37 operations worth $187 billion in market capitalization, according to Spin-Off Advisors LLC, an independent equity research firm. That's an increase of more than 78% from the $105 billion in value carved out of corporations in 2011, though the raw number of spinoffs was down last year, from 47 in 2011. 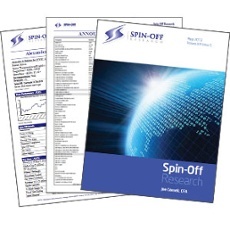 Despite the dropoff in the number of transactions, Joe Cornell, principal at Spin-Off Advisors, said there were more large deals in 2012, including Abbott Laboratories $55 billion spinoff of its research-based pharmaceutical business, now named AbbVie Inc.; the $27 billion spinoff of Kraft Foods Group Inc. from Mondelez International Inc. (formerly Kraft Foods Inc.); and the $21 billion paring of Phillips 66 Co. from ConocoPhillips. "The numbers were skewed a bit last year because there were a couple of pretty large ones but they still indicate that in terms of numbers and size, there continues to be a significant ramping up in spinoffs over the last several years," Cornell says. The top performers among 2012 spinoffs in terms of total return for investors included Kennady Diamonds Inc., which was carved out of Mountain Province Diamonds;Phillips 66;Rouse Properties Inc. from General Growth Properties Inc. and Liberty Ventures Group out of Liberty Interactive Corp. The pace of the past two years indicates that spinoffs might soon return to the precrash levels of 2007, when there were 41 such transactions valued at $225 billion in market cap. In the middle of this spinoff wave, the IRS has decided to review its policies for deciding whether a spinoff is tax-free to the parent corporation and the shareholders who receive shares of the new company. The IRS on Jan. 2 announced that it will no longer issue private letter rulings informing companies whether some key types of spinoffs are likely to be tax-free. The IRS said the policies for those types of transactions are under review and it won't issue private letters advising companies if their spinoff proposals qualify for tax-free status. The notice affected three types of transactions. One is so-called "recapitalization into control," when a company restructures the voting and other classes of stock of the unit to be spun off so that the parent qualifies as the controlling entity of the operation being pared off. To qualify as a tax-free event, the transaction must distribute control away from the parent firm, and thus the parent must be considered in control in the first place. The IRS defines control as holding 80% of the voting stock and 80% of all other classes of stock of the unit being spun out. Distributing companies that failed to meet that test have generally been permitted to "recapitalize into control" by establishing separate classes of high-vote/low-vote stock shortly before the spinoff in order to qualify. The IRS also said it would stop issuing private letters regarding debt-for-debt exchanges in which the parent company retires a portion of its outstanding debt by transferring certain debt securities of the controlled operation to the shareholders. Finally, the IRS said it won't rule on north-south transactions in which cash and other assets are moved from the parent corporation, the "north," to the distributed operation, the "south," before the spinoff. The concern in these transactions is that the transfer of properties within the corporation could create an unintended taxable event. Tax attorneys say the stakes are high in structuring spinoffs to be tax-free. If a corporation ends up being liable for an inherent gain in value of the spun off operation, the bill could be sizeable. Likewise, shareholders would face a big bill for the receipt of new stock of the carved-out operation. By making both liable parties pay tax, the bill could be problematic because unless the spinoff is conducted as an IPO, there is no cash generated in the transaction to pay the taxes. In the absence of IRS letter rulings, distributing companies must rely on the advice of counsel to be confident they have structured their transaction in a tax-free manner. Jeffrey Wagner, a partner in the federal tax practice ofMcDermott Will & Emery LLP, says that issuing private letters has tended to place heavy demands on the IRS and the agency hopes that better guidance will reduce the requests for agency opinions on individual deals. "This is an important area and lots of big names in the tax bar are expected to comment," he says. "Afterwards, they might not feel the need for private rulings and that might lighten the burden on the IRS." Robert Clary, another MWE tax partner, says there's been little decline in the spinoff activity despite reduced clarity on the tax front. "Spinoffs are a corporate and competitive trend, separate from tax policy, that we've seen over last four or five years," he says. "That is likely to continue." Spin-Off Advisors' Cornell agrees that the uncertainty surrounding the tax status of the transaction has not diminished demand. "We haven't seen any fall-off this year and activity has accelerated in the last two months," he says. So far this year 16 spinoffs have been completed and at least 26 are on deck. Cornell attributes much of the interest in pursuing spinoffs to the current phase of the economic recovery. "The easy moves companies can make to create value have been done - they've cut costs; they've become efficient. The low-hanging fruit is gone," he says. "At this point you think your company has value that's not recognized in the stock market this may be a way to create shareholder value." He also notes that activist shareholders have been much more aggressive in pressuring managements to break off pieces of their companies or restructure. "If your stock hasn't done anything in five years, they are trying to force the issue to get value unleashed," Cornell says. The trend is paying off for investors. Cornell notes that the Bloomberg Spinoff Index as of June 24 was up 16.74% for the year versus 11.24% for theS&P 500. "It's been very good for shareholders," he says. Through each phase of the digital revolution, the belief in Tribune Tower held: Owning newspapers and television stations made Tribune Co. a stronger media conglomerate. That strategy was officially cast aside Wednesday in the announcement from the company's Michigan Avenue headquarters that it plans to spin off its publishing business, which includes the Chicago Tribune, into a separate entity. The move confirms CEO Peter Liguori's vision of shaping Tribune Co.'s future around television. Last week, in a similarly bold step, Tribune Co. said it would significantly increase its broadcasting holdings with the purchase of 19 TV stations, giving it 42 total. Wednesday's announcement not only means a shift from an 89-year strategy of pairing broadcasting and print, but it also likely delays any sale of the company's publishing assets until at least 2014. Since February, Tribune Co. had been exploring the potential sale of its eight daily newspapers, but Liguori also held out the possibility of retaining them. Although a spinoff had not gotten as much attention as an option, analysts said it would bring a tangible tax benefit. Tribune Co. could offload its newspapers while avoiding the large capital gains taxes it would incur from any outright sale. "It's an astute move," said Robert Willens, a New York-based tax analyst. "After the spinoff occurs, the sale can take place, at which point the corporation is off the hook for any taxes." A detailed plan is expected to be developed in the next nine to 12 months that, pending board approval, would create Tribune Publishing Co., a separate entity with its own board and senior management team. Tribune Co. stakeholders would receive a tax-free distribution of shares in the new company. Only the newspapers and associated assets would move to the new publishing company. The newly streamlined Tribune Co. said it would retain all other holdings. These include 42 local TV stations (including those gained upon the closing of last week's announced $2.73 billion acquisition of Cincinnati-based Local TV LLC), WGN America, WGN Radio, Tribune Studios, Tribune Digital Ventures and Tribune Media Services. Equity interests in Classified Ventures, CareerBuilder and Food Network, and all real estate assets, including Tribune Tower and Freedom Center, would also remain with Tribune Co.
Tribune Co.'s roots are in publishing. It was founded 166 years ago as the Chicago Tribune and diversified into the nascent broadcasting industry in 1924, when Col. Robert R. McCormick put radio station WGN-AM on the air. Acquisitions through the years, including the 2000 purchase of Times Mirror Co., built Tribune Co. into a multimedia empire that included newspapers such as the Los Angeles Times as well as TV stations. But synergy between broadcasting and publishing proved elusive. Almost a year after the company went private in 2007, it filed for bankruptcy, emerging in December after four years in Chapter 11. Liguori, a longtime TV executive who took the reins of Tribune Co. under post-bankruptcy ownership in January, has set about to transform the company with a broadcasting focus, positioning it to be a bigger player across the full entertainment spectrum, including the development of more original programming. At the same time, the company has been exploring the sale of its publishing business, hiring investment bankers in February to manage inquiries for its eight daily newspapers, which were valued last year at $623 million. That's a significant reduction in value, reflecting the decline in print newspaper advertising and readership with the emergence of the Internet. But even as they struggle to adapt to a world where more readers get information from their computers, tablets and smartphones, Tribune Co.'s newspapers, which include digital platforms, are still profitable. In a memo to employees, Liguori said the separation will strengthen broadcasting and publishing as their divergent paths take shape. "The separation is designed to allow these two companies to have greater financial and operational focus, the ability to tailor their capital structures to specific business needs and a management team dedicated to strategic growth opportunities with maximum flexibility — in short, each will be a stronger company when separated from the other," Liguori said. David Bank, an analyst at RBC Capital Markets, said that spinning off the lower-margin publishing business might be a benefit to the entertainment-focused Tribune Co. in raising capital. "They have two potentially different investor bases," Bank said. "Could you expand your potential investment base by having a cleaner entertainment story? Maybe that's a benefit." Bank also said that the publishing business might benefit operationally. "When you're focused on a single line of business, you're less distracted by the future of the business as it's playing out, so you can focus on being a publishing company," he said. "Maybe that helps from a strategic perspective that you're focused on your line of business." Part of that distraction has come from the possible sale of its newspapers. About 40 parties have expressed interest in acquiring some or all of Tribune Co.'s newspapers, according to sources, but the expected May opening of a "data room," providing would-be buyers detailed financial information about the company, didn't happen. "If somebody had come in and offered the right amount of money, it probably would be gone," California-based media analyst Alan Mutter said of the newspaper group. "So now they're trying to insulate the core business and deal with publishing in the most tax-efficient and productive way that they can in terms of what value they can finally realize from it." Willens said the delay was likely intentional. Tribune Co.'s newspaper assets have a very low cost basis, meaning any outright sale will bring a hefty tax bill. He pegged the tax liability at about $250 million for a $600 million sale. If the price were to rise to $1 billion, Tribune Co.'s tax bill would be about $400 million. But if Tribune Co. has "neither agreed to nor substantially negotiated" a sale price before the spinoff, it would not be liable for those capital gains taxes, according to Willens. He said the decision to not proceed with the data room essentially "eliminates the possibility" that such negotiations could take place. Such a sale could then be consummated after the spinoff is completed in nine to 12 months. "We have quite a few examples of recent spinoffs that were followed almost immediately by sales of the spun-off company," Willens said. "In none of those cases were the spinoffs rendered taxable by the sale." Tribune Co. could still sell its newspapers at any time, for the right price, but given the tax savings, Willens thinks a post-spinoff sale is much more likely. "I just don't see that happening, because the gain here would be so large and the taxes would be so substantial, it seems inconceivable to me that a buyer could raise the price to the point where Tribune would become indifferent," Willens said. Tribune Co. also said it may owe the Internal Revenue Service more than $500 million in capital gains taxes from the divestments of Newsday, the New York newspaper, in 2008 and the Chicago Cubs in 2009. Those transactions were structured as leveraged partnerships rather than outright sales, a complex strategy that has been challenged by the IRS. While any tax liability likely would remain with Tribune Co., Willens said it is not unusual to apportion the debt during a spinoff. "They can certainly enter into an agreement which would require the newspaper company to compensate or indemnify Tribune Co. for a portion or maybe even all of that tax liability," he said. "It's really up to them how they work that out." Beyond tax issues, the separation would allow Liguori and other Tribune Co. executives to focus on building a large TV and entertainment company, which ultimately could go public. At the same time, new executives, who have yet to be named, would run the newspaper company or orchestrate its sale. The spinoff theoretically makes an eventual sale less cumbersome because it now is clear which entities are included and which are not. There had been questions, for example, about how businesses such as Tribune Co.'s stake in CareerBuilder might be included. Liguori's memo left open all options for the newspaper business. "Pursuing the separation of our publishing and broadcasting businesses will also allow us to maintain flexibility as we continue considering all our strategic alternatives for maximizing shareholder value," Liguori said. Tribune Co. publishing revenues declined less than 1 percent, to $2 billion, for 2012, accounting for nearly two-thirds of the company's operating revenue but only 20 percent of operating profit, according to financial statements released last month. Broadcasting revenues gained 4 percent, to $1.14 billion, and produced 80 percent of the company's profit. "The two companies resulting from this transaction would each have revenues in excess of $1 billion and significant operating cash flow," Liguori noted in a news release. "We expect that this transaction will serve our shareholders and employees well, and put these businesses in a strong position for continued success." Subject to regulatory approvals, Tribune Co. would be the latest in a line of high-profile media companies, including E.W. Scripps, Belo Corp. and most recently News Corp., to split into broadcasting and publishing entities. Last month, Gannett Co. agreed to buy 20 TV stations from Texas-based Belo for $2.2 billion. Other companies, including locally based Kraft, Motorola, Abbott Laboratories and Sara Lee, have gone through spinoffs in recent years to unlock shareholder value and to create more streamlined companies that might be able to grow more quickly. "After a spin, both parts are better run because of focus," said Joe Cornell, founding principal of Spin-Off Advisors LLC, a Chicago-based equity research firm that focuses on spinoffs. "Management is better incentivized. It tends to amp up an organization's entrepreneurial zeal. They bring out new products, capitalize their business properly. They offer stock and options to their management team, which tends to incentivize them to make the right moves."